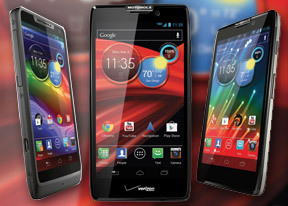 Motorola just finished announcing the new additions to its Android-powered RAZR family of phones, with the RAZR HD and RAZR MAXX HD leading the charge. Before the announcement, Moto pointed out the areas where most of the R&D effort was focused - slim devices with great battery life and excellent performance. It was pretty clear from the beginning, what they are talking about. The Motorola RAZR HD retains the same hexagon overall shape with rounded corners as the original RAZR, but brings some important updates to the design. One of the biggest changes is the new screen - it has grown to 4.7 inches and is still a Super AMOLED, but it has 720p resolution now. It looks like it's employing a PenTile matrix, but we can't tell for sure with that kind of pixel density and under the available lighting. Motorola calls the screen "edge-to-edge" and while the side bezel is indeed quite thin, it's still there. The capacitive keys are gone, replaced by on-screen buttons (as the big Goog dictates). The phone is not as thin as the previous RAZR - the RAZR HD measures 8.4mm, but the thickness is much more uniform. There's still a slight hump for the camera, but nothing as bad as on the previous model. The RAZR HD is advertised as smaller than competing phones with a similar screen size and it does in fact feel way more compact than an HTC One X, which has the same screen diagonal. The back uses the same soft, rubbery, grippy Kevlar material that we loved so much on the previous model. The 8MP/1080p main camera is here and it's no longer on a separate back plate, it's just placed on the Kevlar. The RAZR HD is LTE-enabled and uses Chrome for Android, which Moto pointed out is faster than the stock Android browser and even 40% faster than Safari on the iPhone 4S (in their benchmarks, we're sure). The list of specs sheet highlights continues with a fast dual-core processor. The HD uses a Qualcomm-sourced chipset (bye, TI) with a dual-core Krait at 1.5GHz. The RAZR HD will launch with Android 4.0.4 Ice Cream Sandwich, but Moto made a serious commitment to Jelly Bean updates. And to address the battery life point, Motorola put a 2,530mAh battery inside the standard RAZR HD. Officially, the battery is said to last 6 hours of web browsing even when using power-hungry LTE networks. There are some other minor design changes over the previous RAZR. The microHDMI port is still on board, but it and the microUSB port have been moved to the side of the device. The 3.5mm audio jack remains on top. On the other side of the phone, there are the rather thin Power/Lock key and volume rocker. We didn't spend too much time with the Droid RAZR HD, but the build quality struck us as rock solid. The smartphone felt as a really expensive device helped by the excellent choice of materials and build quality.